I’ve been saying for days I didn’t realize how much I missed Sylvain Reynard’s writing until I read this book. I missed his lyrical and enthralling prose. I missed the way his mind intertwines works of art, literature, social issues, and the beautiful and vividly described settings from cities around the world. This time, the author takes us to beautiful cities like Paris, Geneva, Moscow, Dubai, and Santorini. All these elements tethered to fascinating characters, create an intelligent and compelling story that putting it simply it will blow your mind away. I really liked The Roman (third book in the Florentine Series) and during all this time I really thought it was my favorite book. And then, #TMITBS happened… Both stories left me feeling whole. Complete. As a reader, utterly satisfied. However, I’m more inclined to say that The Man in the Black Suit, is SR’s best work so far. 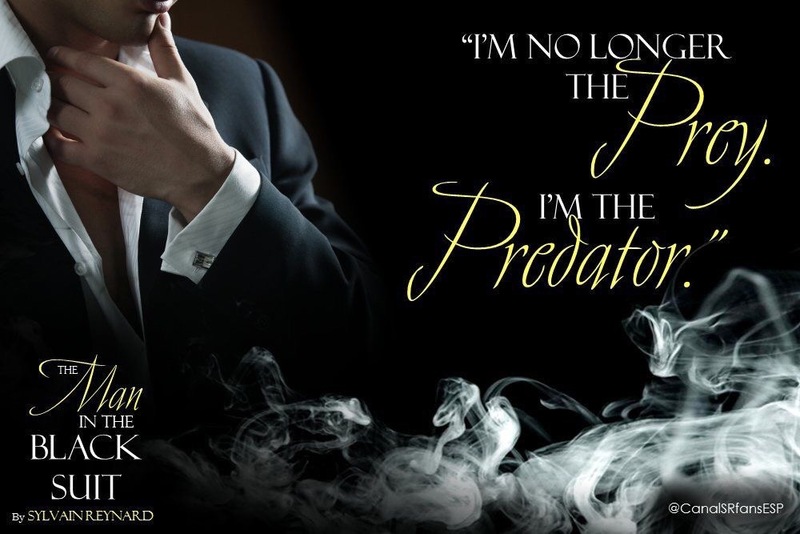 Sylvain Reynard will drag you into his new world instantly. From the very beginning till the very end, you’ll not only be reading a story but actually “see” how the story unfolds as if you were watching it in a film. 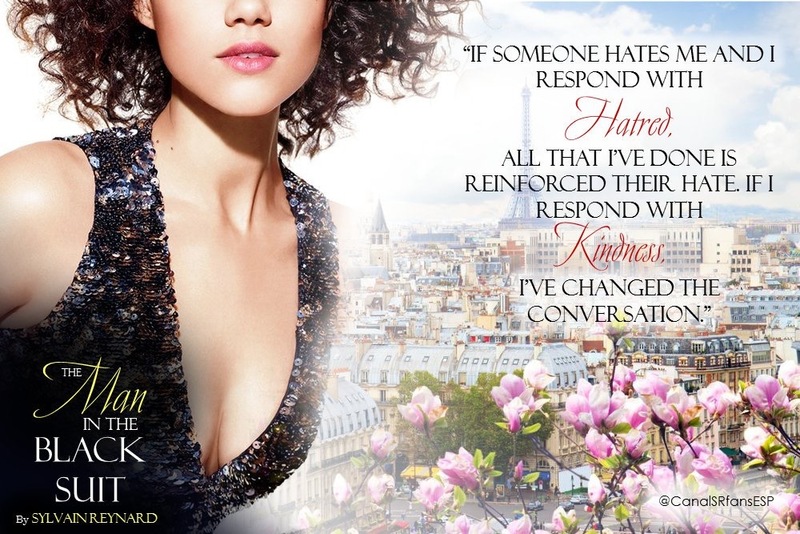 Acacia Santos is a well-educated woman who works as a concierge at the Victoire hotel in Paris, where she meets the enigmatic and mysterious Pierre Breckman, a highly valued but mysterious guest at this hotel. Both characters hold many secrets and none of them trust easily in others. In time, you’ll learn that nothing is what it seems, and when you think you figured out what mysteries lie behind these two characters, the author surprises you with a new plot twist. I’m sure the readers will love Acacia. Our leading lady is intelligent, protective, kind, strong, determined, a perfect match for Nicholas’ wit … and a woman haunted by her past. A dangerous past that hasn’t let her accomplish her dreams. As a Brazilian living in Paris, she’s no exception of being on the receiving end of discrimination from some people, but she deals with it with kindness and grace. Nicholas is Acacia’s perfect match. He’s smart, attractive in a way that goes beyond physical appearance, very interesting and a very passionate and reverent lover. I love the French endearments he used with Acacia (mon amour, mon coeur, mon trésor, and mon ange.) The love scenes between him and Acacia are breathtaking, classy, sizzling hot and very intense, but he’s also so tender and so protective of her that it’ll melt your heart and perhaps even make you forget about Gabriel and William for a while. I didn’t think it was possible, but he did. For Nicholas, his family is precious and he will do whatever is in his power to keep them safe and to bring justice and closure to a tragedy that hurt them years ago. But the way Nicholas chose to do justice is dangerous and comes at a high cost. The question here is, is this a path Acacia will be willing to follow? This book is different from everything Sylvain Reynard has written before. His unique and beautiful writing style only gets better with each book he writes, but he isn’t only gifting us with an incredible story. This time, his reading community takes a leading role. The author honors his Brazilian community of readers in Acacia and gives a very special and touching gift to his Brazilian podcasters that I’m sure they will never forget. But this is Sylvain Reynard, and we know he appreciates all his readers around the world. Therefore, they will also find a special gift for them as well. Acacia speaks six languages; languages that are spoken by his readers and which represent the diversity of his international reading community. He also salutes the readers, fans accounts admins and podcasters when he uses the term “the boss” so commonly used by his readers to address him in describing the way Nicholas’ employees refer to him. We find many traces of the messages Sylvain Reynard shares with us constantly in Nicholas and Acacia’s dialogues, but in a depth that gives them a new level of meaning and purpose. As someone who has followed Sylvain Reynard for a few years, it was the icing on the cake to feel that the readers and the author are also a perfect match. The Man in the Black Suit is a gesture of courtly love between a profoundly grateful Canadian author and the readers, old and new. I never felt a book so intimate before. This story is perfection. It’s the kind of book meant to read several times. It’s flawless. I asked myself what I’d change in the story to make it better, and the answer is nothing. I wouldn’t change anything at all. I give The Man in the Black Suit 5 Brilliant Stars.